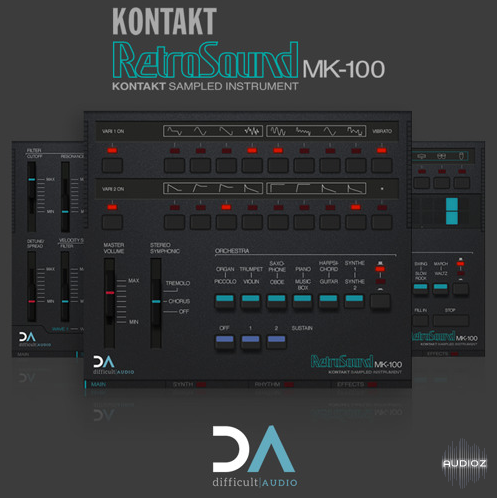 The RetroSound MK100 is a combined synth and drum machine based on the MK100 from the early 80s, lovingly recreated for NI’s Kontakt sampler. All synth presets can be customised with different waveforms and envelopes in exactly the same way as the hardware, together with the chorus and tremolo effects. In addition we have the ability to bring Kontakt’s synth engine to bear on the source sounds, so each of the two synth layers can have it’s own independent filter and envelope settings. All the preset drum patterns and fills are present, as is the Custom Drummer. The drum voices aren’t just limited to the straight preset sounds on the hardware, but can be modified in a number ways - and in addition to the real-time pattern recording from the original, a full graphic step editor lets you edit your patterns, as well as full MIDI keyboard driven operation for real-time jamming and creative sessions. And the effects page ties it all together with a reverb and delay, and some other output effects to further shape the output - or you can just leave the FX off and use your usual plugins as required. The MK100 was a little gem of a home keyboard. Unlike it's contemporaries, the stereo-chorus equipped MK100 had 12 standard presets consisting of two layers, and you could customise the waveforms and envelopes each used (the manual proudly proclaimed “1,376 sound possibilities!”). And it actually sounded good! While it’s not an FM machine, it’s voicings and waveforms (and colour scheme!) were clearly derived from the brand new DX range. As it result, it sounded afresh, and looked fabulous! Not only that, but alongside the preset drum patterns you had a programmable drum machine - yes, for perhaps the first time in a home keyboard you could write your own drum patterns! Difficult Audio RetroSound MK2 KONTAKT-SYNTHiC4TE has been exclusively released on AudioZ by Horsemen who chose to ask not to post mirrors. Sir Horsemen has dropped the goods out the stable here. Beatskillz Retrokz is similar. You haven´t try it yet? Lots of missing samples. 64Mb?! Something is clearly wrong here.